This impressive home offers generous space and flexibility for those looking for a large home that can accommodate the whole family. The 2 storey residence offers 4 good sized bedrooms plus separate study, plus there is the potential for a second upstairs study. The generous living areas offer separation for everyone to enjoy their own space and include a lounge/cinema room with upgraded flooring, family room and separate games room/rumpus, as well as an informal dining area off the well equipped kitchen, plus there are the added benefits off new internal doors, ducted vacuum and ducted air conditioning, plus 3 full bathrooms. The entertainer will love the merbau timber deck enjoying summer BBQ's, overlooking the sparkling inground pool that includes it's own deck area and there is still tonnes of room for the kids and dogs to play on the generous 709m2 block. 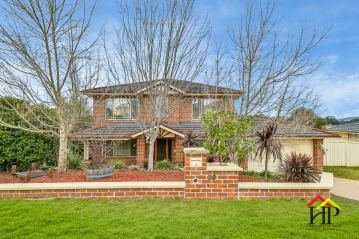 This great family package offers double garage with drive thru access, plus there is the added advantage of a big side access and you are within walking distance to the schools and local shops and just minutes away from Narellan Town Centre. Call 4647 3999 now to arrange your inspection, so that you can call this your new family home. - 4 Bedrooms plus study - 3 Bathrooms - Separate formal lounge/cinema room - Games room - Entertainment deck - Sparkling inground pool - Big backyard - Ducted air and Ducted vacuum - Double garage drive thru and side access - Close to shops ALL PROPERTIES ARE AVAILABLE TO INSPECT BY APPOINTMENT OR AS ADVERTISED Harrington Park Real Estate have in preparing this information used our best endeavours to ensure that the information contained herein is true and accurate. Prospective purchasers should make their own enquiries to verify the information contained herein.